Further details of how to climb all of the peaks featured here are available in 'The Andes - A Guide for Climbers' by John Biggar (ISBN 0-978-0-9536087-4-4). Available for purchase on our Guidebooks page. Aconcagua, 6969m, from Casa de Piedra at sunrise. Ojos del Salado, 6893m, from the Argentine side at Cazadero Grande. Monte Pissis, 6793m, from the Laguna Verde. No. 5 in the Andes, the little known Tres Cruces Sur 6749m and no. 11in the Andes, Tres Cruces Central 6629m, seen from the summit of Ojos del Salado. Huascaran Sur 6746m on the right and Huascaran Norte, 6655m seen form Anta in the Callejon de Huaylas. These are the 6th and 10th highest Andean peaks. High on the glacier on Llullaillaco on the Chile/Argentina border, At6739m this is the 7th highest in the Andes, and the highest peak known to have had an ascent at the time of the Incas. Cerro Mercedario at about 6700m is the 8th highest in the Andes. Cazadero 6658m, aka Walther Penck from above the El Arenal base camp. The 10th highest is Huascaran Norte, see picture of Huascaran Sur above. The 11th highest is Tres Cruces Central, see picture of Tres Cruces Sur above. Incahuasi on the Chile-Argentina border is 6621m high. Yerupaja, 6617m is by far the hardest and most dangerous of the top 20, and the highest point of the Cordillera Huayhuash. There have been several deaths in recent years on this the unlucky 13th highest Andean peak. Tupungato 6570m, from the north at Punta de Vacas. Sajama, 6542m is the highest peak in Bolivia. Sunset over Antofalla, c.6440m, the 17th highest peak, Argentine Puna de Atacama. 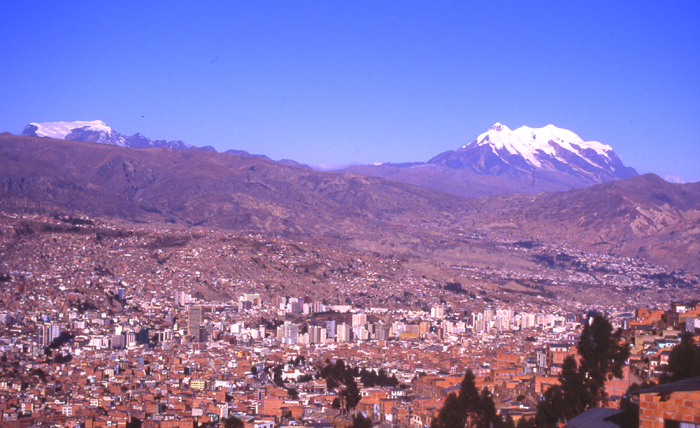 Illimani 6438m as seen from the Bolivain capital city of La Paz. Nacimiento is currently listed as the 19th highest Andean peak, quoted at 6436m it is actually more like 6445m or even 6450m high. The steep cone of Veladero, above the central hiker, is at 6436m the 20th highest Andean peak. All photos John Biggar, © 1995-2016.